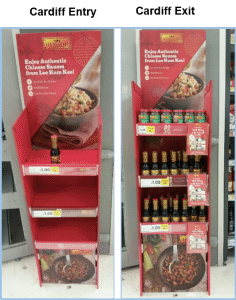 Site client branded FSDU’s across Tesco stores to support a Chinese New Year Promotion across 40 Tesco stores. 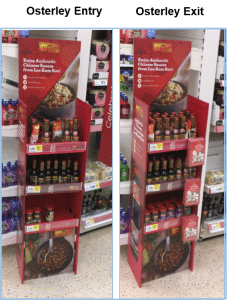 Conduct 3 visits per retailer, visit 1 – Pre-sell branded FSDU, visit 2 – Set-up and site FSDU and visit 3 – ensure the units are fully replenished. During the first visit, the teams spoke to the store manager / section manager and handed then a document provided by our client explaining the reason for siting the branded FSDU’s in their store. The teams then confirmed which stores agreed to have the branded FSDU’s sited in their store. The FSDU’s were sent directly to Assosia HQ flat packed, which was then distributed to the field team. The second visit consisted of the field team building the FSDU whilst in store and fully replenishing the unit with the correct products. 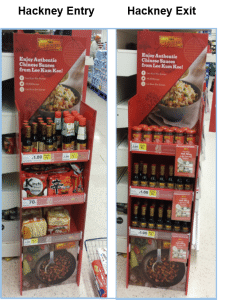 Visit 3 required the team to fully replenish the unit with additional stock (where possible) and site recipe cards onto the FSDU. A total of 40 Tesco stores were visited, of which 73% of stores agreed to site the FSDU in their store.